If you don’t already know about Google Plus, it’s clear you’ve been watching too much of the Casey Anthony trial. Google Plus (G+ or +) is Google’s attempt to unify most of its web-based applications by socializing them. With growing integration into Google Docs, Reader, Search, and more, Google Plus is already poised to be the Facebook-killer. Throw in Hangouts, a video chat feature, and Gmail, and some are already calling Google Plus the winner in the social media war. Yes, it’s that effective—even in beta. One of the unique features about Google Plus is Circles. Circles act like categories for your friends, family, clients, acquaintances, and other people. That’s a brief, but effective description of a powerful feature. When you add a person on Google Plus, you must add them to a Circle. Unlike adding as a friend on Facebook or following on Twitter, you must add them to Circles which immediately creates a system of categorization. Google went a step further and allows you to add a person to multiple Circles/categories. Why categorize your social contacts? If you think of Google Plus as “social email” it starts to make more sense. Generally, when using email, you don’t inundate your family with web hosting specials, and you don’t spam your clients with the latest Internet memes about Keanu Reeves or cats. Sure, you might be guilty of sending Sad Keanu to a client or your Mom, but that’s not typical of most email users. Yet, it’s abundant on social sites like Facebook and Twitter where post-to-all is the default. Still, it’s not just about you and your presumed awesomeness. 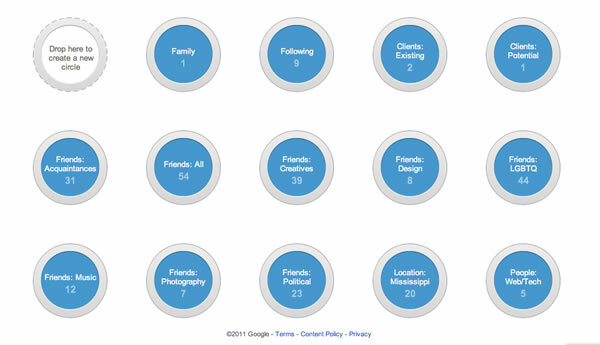 Categorizing your contacts allows you to better consume the incoming content provided by your Circles. Tired of seeing the “social media experts” filling your feed with the latest and greatest trends to get more friends and followers? Drag them to a Circle and read that Circle when you feel compelled. Circles allow you to view content from those you drop in specific Circles. Your stream is now categorized using your own nomenclature. So, where do you begin with Circles? There’s quite a bit about Circles on the Internet—including productivity hacks. Before you go crazy with pro tips, it helps to get the basic foundation in place. I’m not saying my Circles are the way to go, but sometimes it helps to see what others are doing. Here’s a current screenshot of my Circles. I took this approach based on my reality. I tend to have three, core circles: family, friends, and clients. So, I started with those. As I began encircling more people, I realized more Circles were needed. So, I broke them down by interest or involvement: acquaintances, LGBTQ, creatives, design, photography, music, and political. After creating those Circles, I realized I sometimes post information that’s pertinent to my current location. So, I added a Location Circle and will eventually expand those to regions and countries. Of course, there are other people I wouldn’t necessarily consider friends like “social media experts” and famous people. They get their own Circles. Why go through all this trouble? For me it’s not trouble. I do this with my Contacts on my desktop, notebook, iPad, and phones. It’s how I do things already, but it was too cumbersome on other social networks. Mostly, I post publicly. I’m not a very secretive person or worried about Skynet becoming sentient; if someone’s “stalking” me on Google or other social media sites that says more about them than me. Still, I’m aware that some content is very targeted. I can use these Circles to deliver content to the right groups of clients, friends or acquaintances without spamming all Circles. A post about an event in Mississippi is likely not of interest to my friends out-of-state or overseas. Why bother them with irrelevant content? As noted earlier, these Circles also allow me to stay up-to-date with friends by interest. I can quickly access my Family Circle to keep up-to-date with my family or see if anyone in my Client Circle has specific needs I might be able to aid. Without doubt, Circles will greatly improve how we communicate on the social web and allow each of us to deliver relevant content to our Circles. Granted, there will be people who will consistently post to the Public Circle, but that doesn’t stop the overall effectiveness of Circles when used correctly. Hint. Hint. That’s how I’m using Circles. How are you using them?